Alternative Perspectives | What India’s Construction Sector Should Learn from Nepal Earthquake? 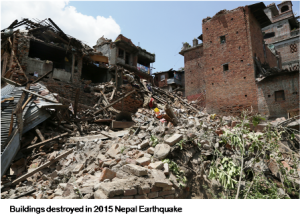 What India’s Construction Sector Should Learn from Nepal Earthquake? India ranks a high 100 out of 172 most vulnerable countries at risk of natural disasters . Population growth, increasing urbanisation, poverty and non-compliance of building regulations has made India’s population highly vulnerable to natural disasters. Alarmingly, India’s largest cities are at greatest risk, Mumbai and Chennai are amongst 10 cities most vulnerable to storms and cyclones; Kolkata ranks 3rd highest in risk for flooding and 5th highest in risk for Tsunami along with other cities such as Delhi rank very high in various risks . The recent 2015 Nepal Earthquake has once again raised alarming concerns that face communities and nations at large after every natural disaster. Severe damage to buildings even in low intensity disasters and an unprecedented damage in medium to high intensity disasters have become a common and frighteningly, acceptable phenomenon. Few have learnt lessons from previous disasters, in Indian subcontinent 90% of residential buildings are un-engineered and unplanned for disaster response. India spent $ 427 Billion in construction in the year 2013 . The construction industry has changed and grown very rapidly in the past 10 years. However, little has changed for masons. Rural and peri-urban construction scenario remains seasonal. This seasonal employment discourages masons from taking positive decisions to enhance their skills. In rural areas, majority of masons still have their primary occupation as farming and resort to masonry as secondary occupation during low season months. It is important to understand this phenomenon, as it provides vital input towards addressing the issue. Agriculture as well as construction season are governed by a) weather conditions and b) religious or cultural calendar which has been existing for generations. For example, the months of June, July and August are most important months for sowing, the month of September is considered inauspicious to start or carry out any construction activity. Agriculture requires full time involvement only for 4-5 months during the year. During low-season, masons (mostly men) work as either daily wagers or on short-term contracts. It is also important to note that not all the masons shift between two occupations, but their numbers are few. This shift in occupations, although results in higher income, prevents masons from investing in formal training; thus, leading to low numbers of skilled individuals in the informal sector. Masons work in areas far away from their native places or where they learnt masonry, seldom understanding the locally available materials, which they end up working with. Furthermore, senior masons who have expertise in working with certain kind of material have incomplete knowledge of these materials. This reflects in their depth of understanding, as well as the buildings constructed by them, which have sub-quality construction. Another way this issue affects the construction industry is low or over utilisation of certain kind of material. Either locally available materials are under-utilised because masons do not have an understanding of the materials, or certain materials are over-utilised due to masons’ understanding of a particular material and likeness to stick to convention. Over the years, Development Alternatives (DA) has interacted with various stakeholders in the construction sector, from policy makers, materials industry to masons. India’s construction scenario not only suffers from low standards of construction, but it is also plagued with issues such as a) absence of benchmarks and standards for skills of masons and artisans, b) severe shortage of skilled individuals, c) low understanding and less use of locally available construction materials and d) low awareness about existing formal training and certification agencies amongst masons and artisans. Although peer learning is prevalent and successful to an extent amongst masons and artisans, it cannot compensate for the lack of standardised skill set amongst them. Senior masons, who usually become the source of learning for junior or rookie masons, had acquired their skills in the same manner. There are a few issues with gaining skills in this manner, a) masons tend to learn in bits and parts, making learning inefficient and ineffective, b) differential standards of seniors masons i.e. the quality of skills vary from one mason to another and c) informal learning methods have no benchmark set, which the junior masons have to fulfil. The level and quality of skills learnt largely depend on the ‘master’ who imparts it, and the ‘trainee’ who receives it. The issue has been worsened with exponentially increasing demand of masons in rapidly developing urban areas, leading to semi-skilled or unskilled masons being passed off as skilled masons and eventually, training or guiding other masons. Out of 41 million people employed by the construction sector in 2011, only 13% were skilled individuals. Only a minority of masons undergo formal training and skills enhancement . While masons are aware about the existence of local Industrial Training Institutes (ITIs), few masons know about the process of getting formal training and its benefits. Another reason that deters masons from generating interest in formal training is the information that flows through word-of-mouth. There are misconceptions on the duration, qualification; quality and cost of training that exist within the masons. As a result, masons do not feel the need for formal training, hence, leading to low interest and awareness about training and certification institutions. Bulk of training is conducted at state level. Majority of these trainings are done in aftermath of a disaster, such as the Gujarat earthquake. Though focused, high quality and effective, such programmes do not continue, leading to minimal impact. One main reason for organisations to be deterred to continue with such programmes is ‘demand’. Both the training agencies and masons are stuck in the demand-based scenario, where there is a lack of coordination between these two stakeholders. With few numbers of masons, the cost of training per masons becomes high. 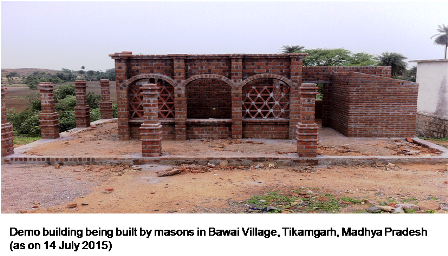 As a result, few years after inception, a programme benefits few masons with little reach in areas most in need. Another issue that has to be addressed is the lack of implementation of standard benchmarks nation-wide on the kind of trainings, level and qualification of trainers, methods, quality and effectiveness of trainings. Apart from Industrial Training Institutes (ITI), there is no nation-wide agency to impart and assess construction skills. Multiple private and non-governmental organisations conduct trainings at various levels. While some of them are very directed and focused on using certain kind of building material, others tend to be basic or lacking a wholesome curriculum. Thus, organisations which conduct trainings at local level, out of good intent are not registered at national scale, thereby, causing little benefit to the masons at the end of the day. There is a pressing need to enhance the skills of masons and an even more desperate need to recognise and standardise their skills, as well as of agencies imparting skills of masons. A new, wholesome training and certification system should consider the following factors before its inception, such that it is a) managed at local or state level for better implementation b) transparent and efficient, c) flexible, requires minimum time with different learning options such as distance learning or on-site learning, d) easily replicable across various states, e) involves the community in management, development and curriculum and f) requires a small amount of resources This will benefit the construction industry and masons as it will a) enhance skills of masons so that they can sustain their development, b) recognise and standardise existing skill set of masons, c) ensure that skills are imparted from an established training curriculum, d) set standard and transparent procedures for assessment of skills of masons, e) ensure construction of efficient, quality buildings by masons and, f) ensure efficient use of resources, along with increased use of locally available resources and reuse of construction and demolished waste. It is envisioned that a standardised certification programme should be established for masons that can be implemented through various agencies at different level. The programme shall a) welcome governmental, non-governmental and private organisations to get involved in training and assessment activities, b) encourage feedback and ideas from all stakeholders to mutually benefit and grow with each other, c) promote use of local, eco-friendly construction technologies and skills, d) be flexible and modular, encourage masons to continue expanding and polishing their skill set and e) bring new opportunities of income for masons. Planning Commission, 2013. ‘Twelfth Five Year Plan (2012-17) Economic Sectors’, Volume II. New Delhi: Government of India.